The legendary bearing developed by Thomas Scheu is an inverted precision platter bearing (the spindle is situated on the base while the bearing shell is inside the platter) made of 100Cr6 ball bearing steel with a contact surface hardness of 62 HRC and bearing tolerance range h6/H6, as used in other Scheu turntables. The solid spindle screwed into the base plate has a ceramic ball on top of it. The low-resonance, heavy acrylic platter is effectively suspended on the bearing and therefore provides its own stabilisation. The DC motor in its own solid housing is separated from the platter and quickly runs up to the speed selected via the rocker switch (33 or 45 rpm). Fine adjustment is handled by a potentiometer, while power is provided from a plug-in transformer. Connection between motor and platter is made by means of a `string´ composed of ultra-fine nylon thread. The advantage of such a `string´ drive lies in the fact that the contacting surface transmitting the force is small. This means fluctuations in tension and unnecessary friction can be minimised. A cylindrical ring filled with resonance absorbing lead shot is located between the base plate, with its three height-adjustable threaded spikes, and the one- or two-lobed tonearm base. Either 9″ or 12″ tonearms may be fitted. 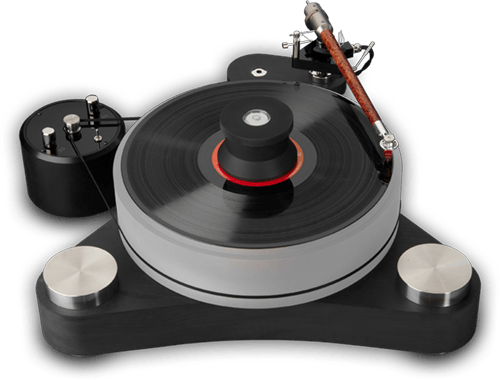 The Premier MKIII offers the capability of mounting two tonearms, which can even be of different lengths. There is also a choice of platter heights: 50 mm (weighing 4.5 kg) and 80 mm (7.5 kg). 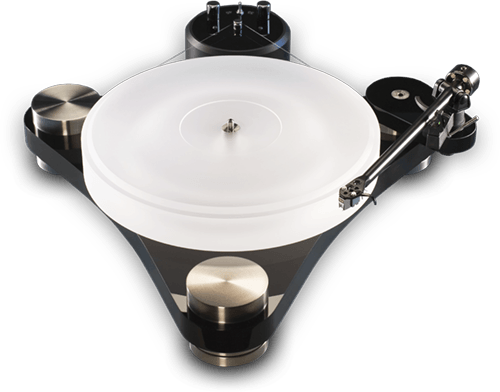 The Scheu Premier MK II is supplied with a tonearm base for either a 9-inch or a 12-inch tonearm. 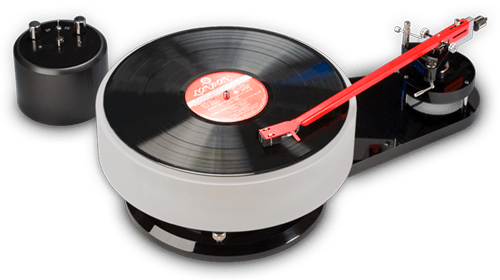 For the Premier MK II turntable, you can choose between two platter heights: 50 mm and 80 mm. 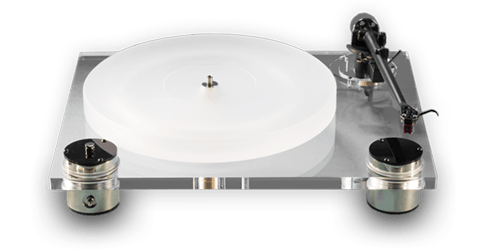 The Scheu Premier MK III is designed in the form of a double shell, where two tonearms can be combined on two bases in any number of ways. Both 9-inch and 12-inch arms can be combined any way you choose. The Premier MK III always comes with an 80 mm platter. The motor is made of solid aluminium and can optionally be black anodized or polished to a high gloss. As standard, dark turntables are supplied with a black motor and light / transparent turntables with a high-gloss motor.